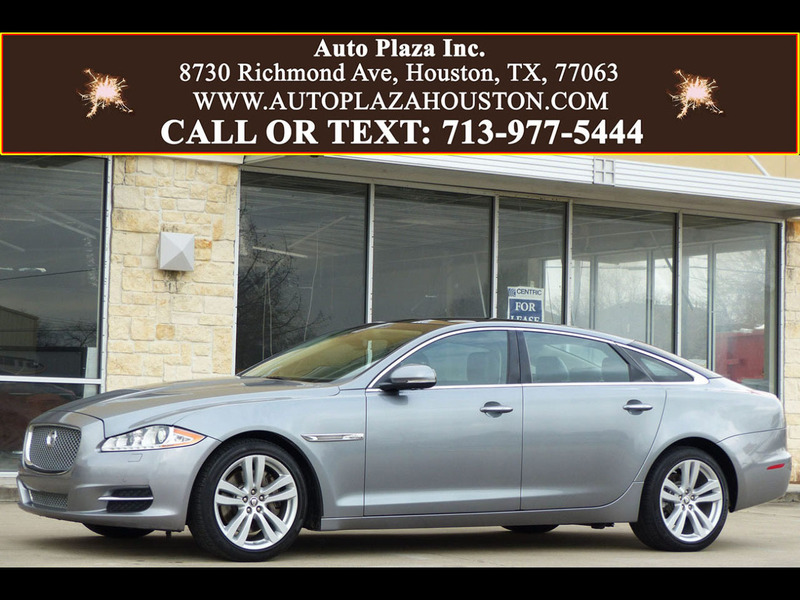 Used 2011 Jaguar XJ-Series XJ L for Sale in HOUSTON TX 77063 Auto Plaza, Inc.
Want a Car that is quite Original, yet Classic and Reliable? Presenting to you this Super Clean 2011 Jaguar XJ L with a Slick 6 Speed Automatic Transmission. Jaguar totally Redesigned the XJ so that it remains one of the top cars in the Luxury Category. Its Quality Engineering and Excellent Performance Output Enable it to Compete with the German Automobiles, Winning itself a place in the hearts of drivers all over. Options Include, Dual Panel Power Sunroof, Navigation, Reverse Camera, Parking Sensors Front and Rear, Paddle Shifters, Push Button Start, Xenon Headlights, Premium Audio, Portable Audio Interface for iPod / MP3 / USB Input, XM Radio, CD/ MP3 Player, Bluetooth for Phone, Power Leather Memory Heated/ Cooled/ Massaging Seats, Heated/ Cooled Rear Seats, Manual Rear Side Window Shades, Power Rear Shade, Rear Vanity Mirrors and Folding Table for Rear Passengers, Power Heated Tilt/ Telescoping Wheel, 19inch Alloy Wheels, Suede Headliner, Traction Control, Audio and Cruise Control Buttons on Steering Wheel, Intermittent Wipers, Wood Trim, Rear Defroster, Dynamic Stability Control, Power Locks, Power Windows, and Much More! Furthermore, this Jaguar Boasts Excellent Road Manners giving it a sporty feel, and Impressionable Handling unlike any Other! We Can Guarantee this Jaguar will Change Your Driving Experience FOREVER! So, Dont Wait Any Longer Call Today!!! Financing Available. ... . . . . . . . . . . . . . . . . . . . . .More Pictures Available On Our Website. . . . . . . . . . . . . . . . . . . . ..WWW.AUTOPLAZAHOUSTON.COM. . . . . . . . . . . . . . . . . . . . . .